The CCCL project is a glimpse of what I work on in my spare time between my various day jobs (which comprises of recording and performing in Carter Tutti, Chris & Cosey, Carter Tutti Void and Throbbing Gristle etc.). The project involves a fair bit of audio circuitry R&D, prototyping and building and some retro circuit modification, although it shouldn’t be thought of as a 'circuit bending' endeavour. 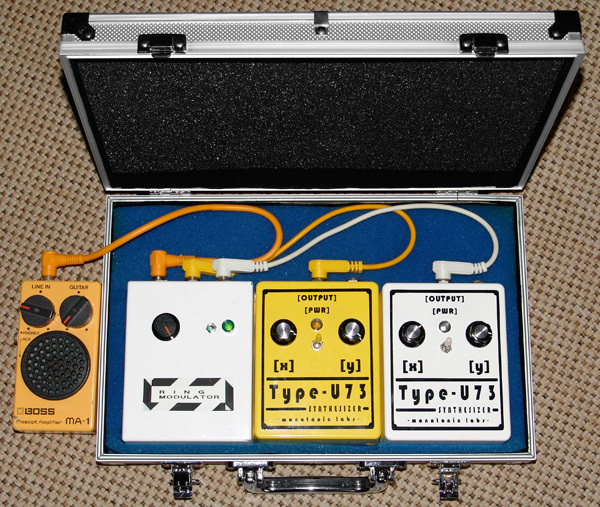 One of my larger earlier CCCL assemblages is the "no Guitars' Boss pedal board and the Tutti Box Mk1 noise generator (see below). I also work with a number of other combinations of desktop effects units, sound generators, synths (modular and otherwise), touch controller and various handheld devices. At this stage the project has progressed in a number of different directions, all of an experimental nature. Occasionally I will make my audio undertakings and compositions available online but the fruition and final outcome (if any) of this project is still to be determined. Most recent posts are at the bottom of the page. "the final outcome is yet to be determined"
Well, seemingly out of nowhere CCCL takes a not inconsiderable step forward to becoming (more of) a reality. A few days ago I took delivery of a Eurorack unit (Doepfer style) and a dozen or so blank fascia panels of various sizes. The Eurorack, bought for a decent price on ebay, is a 6U unit with built-in PSU, but currently sans modules and empty (see left). Originally my intention was to build most of my resurrected circuits into small, individual, self-contained, battery powered boxes and plugged together as needed in a 'modular' stylee. But this proved impractical with many of the circuits: too many controls, boards too large or incapable of being battery powered, plus I've been getting through 9v batteries at an alarming rate, distinctly not 'green'. 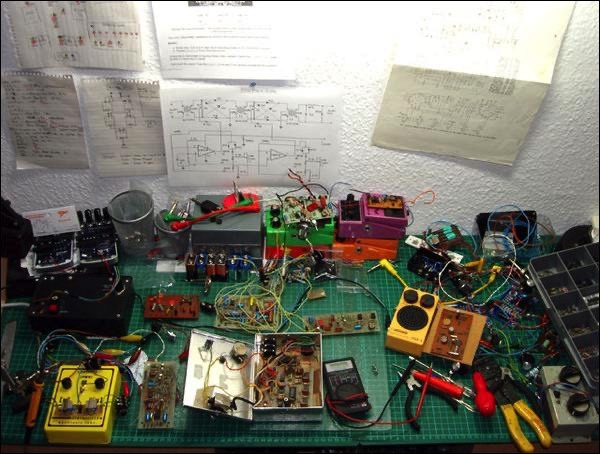 I am not abanding the 'pedal' format altogether as I am still going to build a few basic 'boutique pedals', with each box having a DC socket instead of a 9v battery. 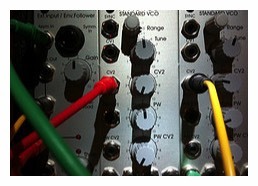 However, after a few discussions with fellow enthusiasts, including an interesting chat with Daniel Miller about Euroracks and esoteric modules I have decided that my new (secondhand) mini modular rack will become the primary receptacle for the majority of my functioning circuits. These new Euro sized modules won't be the usual 'run of the mill' types you'll find in regular Doepfer and Analogue Systems racks (excellent though they are) but will include my original 1970s' boards: vactrol effects and oscillators, unusual modulators & LFOs, random noise generators and various types of distortions. Plus some new designs: a 'multi-micro-sequencer', a 'penta-mod' ring modulator, a 'chaos-mod' multi-oscillator AND a unique Dual-Gristleizer module I'm working on. In progress sounds and photos to follow... I promise! As people may or may not know I just love effects and processors, in fact it's pretty much a fetish. I started using (and buying) effects in 1968-69 when I was about 15 or 16. I scrimped and saved and bought myself a WEM Copicat and a few pedals: a Cry Baby, Fuzz Face and a wah wah pedal whose name I've forgotten that included sound effects (a siren, sea surf etc.). They were fed by a small reel/reel tape deck and an industrial signal generator going through an Eagle mixer. But once the bug had bitten I also started making pedals for myself and friends. Then in 1977 I discovered Boss pedals. The PH1 phaser was my first Boss pedal purchase, followed quickly by a DS1 distortion and a BF2 flanger, and I still have those original pedals (and all modified, by me). 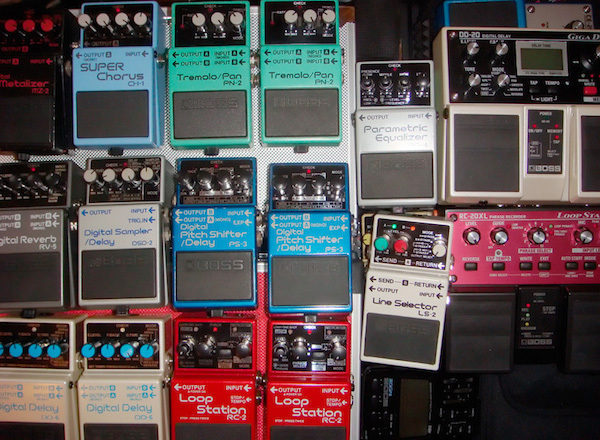 Since I bought my first Boss pedal I've probably owned and used around twenty or so of various types, sizes and configurations, plus of course a whole load of Roland effects units (actually it's even more if I include using many of Cosey's 30-year collection). I'm not entirely sure what it is but there's something about the sound and aesthetics of Boss (& Roland) effects that I really (really) like. Naturally with this compulsion for effected sound I've had (have) many other effects gadgets too: mainly Korg, Zoom, Yamaha, Arbiter and a couple of Behringers. Now I come to think about it they're all mainly Japanese or European units. It's not that I'm anti-American or anything, in fact I always wanted some MXR pedals but was always put off by how expensive (like for like) they were in the UK. But either way no effects come as close to the satisfaction I get from playing with and using, and owning, Boss (& Roland) effects (like I said before, it's more like a fetish). Although I must say Korg comes pretty close when it comes to things like the Kaoss series, particularly the KP3 and miniKP pads, two of my current favourite effects gizmos. Of course I get the best of both worlds by mixing and matching all my pedals and effects units, this is doing the 'modular' thing in its purest form I guess. But... now I only have half a dozen or so Boss effects left. I sold the bulk of them in a moment of madness a few years ago when I though 'down-sizing' our studio seemed like a good idea. It was a brief mental aberration (I also sold my Roland modular system!) and I no longer talk about that period of my life. Anyway... what with rediscovering my old 1970s' circuits and then recently a few more pedals that escaped my 'night of the long knives' purge of madness I've started combining and using them again with my other remaining bits of ancient gear (keyboards, drum machines etc.). And I have to say I'm very encouraged at the kinds sounds and textures I'm producing, which I also find hard to describe. It's a sort of conglomeration of lo-fi digital and analogue effects, but not in an 'industrial' way, it's too slow for that. I'll post some early stage CCCL audio clips here before Xmas. CCCL has taken (yet another) detour since my last blog. As I'd previously said: it became apparent that building many of my rediscovered/resurrected circuits into self-contained battery powered units was going to be impractical, but that I was not abandoning that 'format' entirely. Well over the last week or so while 'rationalising' our (not inconsiderable) archive I found some more discarded effects pedals, a Casio keyboard, a drum machine, a percussion generator (a slightly clapped out 'Clap Trap' to be exact) and a drawer full of original synth books and brochures from the 1970s'. And surprisingly (to me at least) all of these units still worked. The Casio keyboard, a heavily modified MT30 (see below), still sounded great, although the extra custom pots and switches are noisy/failing and all need replacing. PLUS... I also found few circuits and instruction sheets of further MT30 mods I'd never got around to installing. So first on my long CCCL 'to do' list is to renovate the MT30 to it's former glory and add the extra mods. This (particular) MT30 already has a very unique sound, due entirely to the mods: a variable clock rate, adjustable vibrato, octave shift, variable digital distortion and an LFO for extreme modulation. I'm also going to include a ring modulator and a band-pass filter. OK, so this is the first physical evidence of my CCCL experimental music project. It's a self-contained noise synth consisting of: self-built Ring Modulator and two modified U-73 Synthesizers. Amplification in this photo is via a Boss MA-1 micro monitor amp. This has been my workflow using First Build . 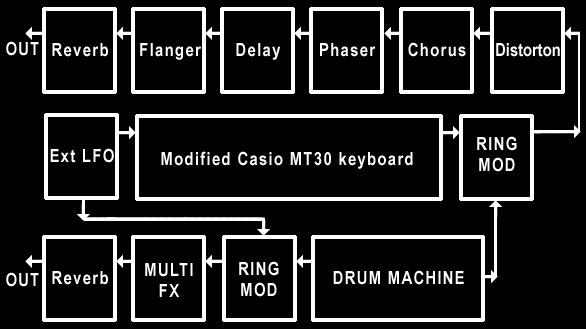 The Casio MT-30 project (earlier details below) is 95% completed. After stripping it down and giving it a good spruce-up I replaced all the noisy pots and switches. The new pots are smaller and smoother than the previous and the new switches have a more positive 'click' action. I had to remove the internal speaker to accommodate the new circuitry and I also removed the old (unreliable) rear phono output socket and replaced it with a regular jack socket. Same procedure with the old DC input socket. The newly included ring-modulator is the only thing I'm not entirely happy with. At the moment both the carrier and modulator are being fed by the MT-30 audio so it acts more like a kind of harmonic octave shifter (upwards). But I've left a hole on the rear of the case to take a switched jack socket for feeding in external audio (an oscillator, or whatever) to the modulator input, which should be fun. The newly refurbished and further modified Casio MT-30 keyboard. The internal speaker in the photo below was removed to accommodate the new circuitry. Close-up view of modifications in top right panel. Includes: the fixed/variable master clock, tune, primary octave switch, variable digital distortion, ring-modultaor balance and a psuedo/semi random function. Close-up view of modifications on the left end column. Includes: 'quick' memory select function, secondary octave switch, vibrato rate (slow or slower), vibrato depth (none or shallow) and hold. 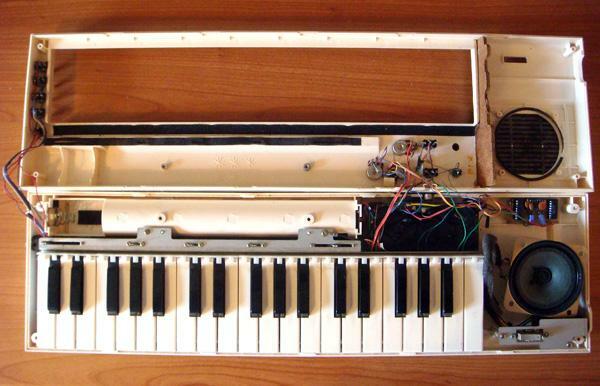 All these modifications work in addition to the existing Casio controls. One step closer... I'm a lot nearer now to actually putting (what could be) the sound of CCCL into the wild. After a lot of R&D, patching, experimenting and modifying I'm almost ready to put my 'No Guitars!' pedal collection (well most of it) into a flight case and wire it all together. When this is done I plan to do some 'live in the studio' recordings direct to disc (no guitars, no MIDI, no editing). When I say soon... I mean soon'ish, as it will probably be within the next 1-2 months. I've just uploaded my first CCCL track: Haz Chem (beta3). I can't really say it was recorded using any of the modded, bent or self-built gear I've been mentioning lately but I thought I'd put it in 'the wild' anyway as it's one of the first experimental pieces that I've committed to a recording NOT using my usual (C&C+TG) gear. A Gameboy ASP running a couple of Nanoloop sequences > into a Boss PQ-4 parametric EQ, mono out > into a Boss PN-2 Panner (square-wave pan setting), stereo out > into a Boss RV-5 reverb (Gate setting), stereo out > into a Boss DD-6 digital delay (modified), stereo out > into a Mac G5 recording (via MOTU 828 mkII) into Soundtrack Pro. All realtime tweakery (mostly the PQ-4 + DD-6), no editing. 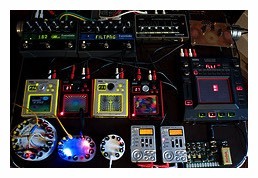 Realtime, hands-on, looper and effect processor. Here being driven solely by one of Tom Bugs' PostcardWeevil noise generators. In theory this whole unit can be (has been) battery powered but that's impractical so I run it all off a single 9v PSU. As part of this ongoing CCCL project I recently recorded a short video of some experimental sounds as a 'tribute' to the experimental work of the BBC Radiophonic Workshop who staged a performance in London on the 17th May, that I couldn't attend. All the sounds and loops originate from a BC8 synth, a Gakken SX-150 synth and BugBrand Weevil synths. 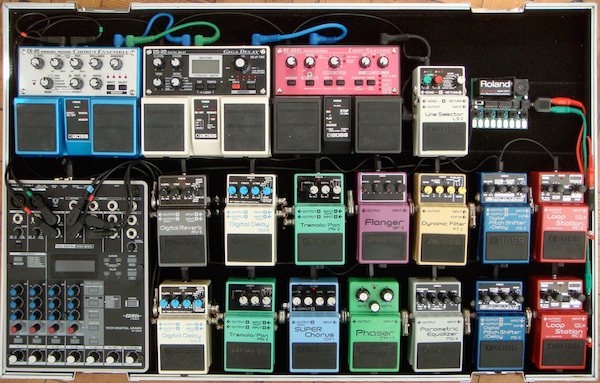 All the effects and processing is done with Boss pedals. Well my intention of putting together a new modular system is back on track again. But as is always the way there has been a change of plan. This was initially brought about by the PSU in my first Doepfer rack failing (see previous post about this rack). 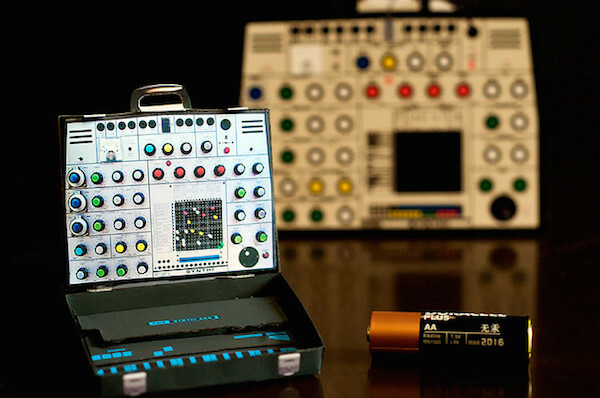 I'm now going to build a similar sized system but using multiples of the smaller self-contained Doepfer A-100 Mini Case. I already have a few basic Doepfer modules and the circuits and parts for some of my own module designs but I'm also working on an idea of putting the new Gristleizer PCB into a Eurorack format panel. If this concept is 'doable' I'll start documenting the construction process as & when I begin. For some time now, well since I sold all my analogue and modular synths back in 2007-8 - a moment of madness I'm still trying to live down - I've been hankering after another EMS Synthi... specifically a Synthi AKS, or Synthi A. I used to have an EMS Synthi VCS3 back in the mid-late 70s' and I loved it, but had to sell it just before we started TG (that's another story). But since selling much of my old analogue gear last decade I've been looking to buy a self-contained analogue synth that I could travel with and the Synthi AKS would be ideal for my purposes. I've come across a few over the years, some utterly knackered (technical term), some pristine and some outrageously overpriced but I've always missed out in some way on a sale. The market value of EMS synths has risen exponentially over the last 10 years and some currently go for crazy prices, usually in bidding wars on eBay. Where frankly these things can get totally out of hand in the heat of the moment. Which is typical of most auctions I've attended, virtual or not. When I was in LA a couple of years ago my friend Lustmord mentioned that he was selling his Synthi AKS but at the time I wasn't in a position where I could make a decent offer for what was a really nice unit. As is happened he sold that AKS last year for $7k, on eBay. Like I said, some sell for outrageous prices. Well I think i've waited long enough now so I'm putting the word out there that I'm 'seriously' looking to buy a Synthi... though I can't go to $7k and I don't really want to bid on eBay but I will consider most sensible proposals for a decent unit. Also I'd rather buy from the UK, or maybe Europe, but no further. btw: I am already on the waiting list for Robin Wood's new batch of Synthi A & VCS3 units. Well it looks like my quest to get an AKS is going nowhere fast. I can't believe how may scammers and ne'er-do-well's have been in touch, or I have contacted, supposedly selling a Synthi. Anyway... I'm on Robin Wood's list for one of his new AKS units - but we'll see how long that takes, it could be quite some wait I'd think. In the meantime I've decided to forego any opportunities that come my way and instead invest my hard earned cash in some other piece of music related hardware. So unless you are selling an original, pristine, fully working, 'as new' AKS for a lot less than 3K (the price Robin Wood is asking for a brand new model) don't bother getting in touch. In the meantime I got a nice Synthi AKS miniature in kit form recently - click below for a high-res photo. While sorting out what gear to use for my upcoming visit to STEIM in Amsterdam I recently recorded a short low-key live improv set straight onto my Zoom H2 recorder. I generated some rhythms using two Kaossilators - going through two mini KPs, and manipulated some bass loops with a Korg KP3 pad. I had a Chimera BC16 synth (the LFO and the ADSR) voltage controlling a BC9 synth and two Eventide stompboxes. I synced and beat matched on the fly using 'tap-tempo' buttons on the Korgs and Eventides. Two Kaossilators, two mini Kaoss pads, a KP3 Kaoss pad, a Tom Bugs WOM synth, Chimera BC8, BC9 and BC16 synths, two Zoom PFX-9003 effects, an Eventide Modfactor, an Eventide Timefactor, a Dirty-Carter E.S.G.I synth, a portable Edirol mixer and a Zoom H2 for recording. No MIDI, keyboards, laptops or desktop computers were used. 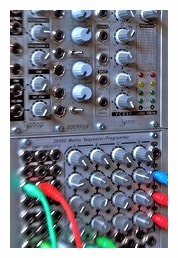 These are some of my new TipTop Eurorack synth modules. The next modules to be included in the system will be of the self-built DIY variety - and a couple more TipTop modules... coz they're fantastic! 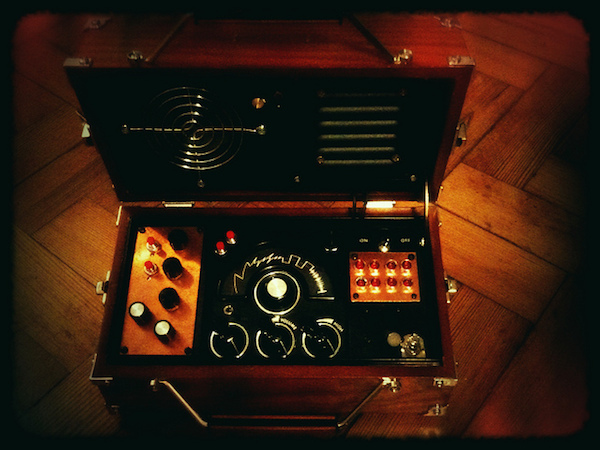 The Tutti Box is the first in a series of CCCL scratch-built, self contained, experimental sound generators. I built this unit specifically for Cosey Fanni Tutti (hence the name) to perform with at the upcoming Throbbing Gristle shows (details at throbbing-gristle.com). 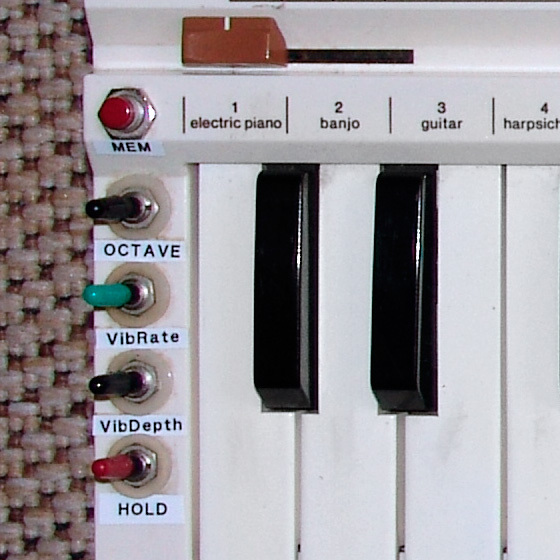 Tutti Box consists of five oscillators. 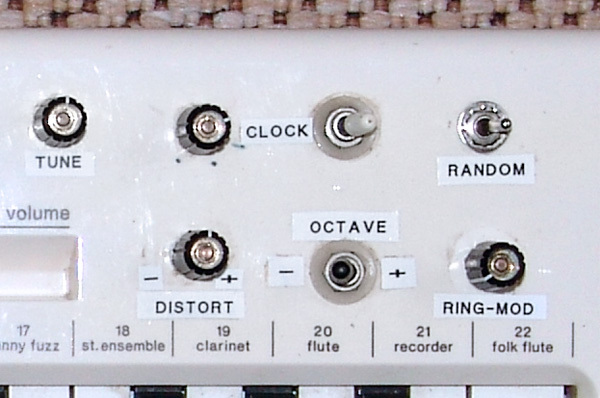 Three of these VCOs are connected in a feedback loop with the output of each affecting the frequency of the next, with a master oscillator modulating the first VCO in the chain. 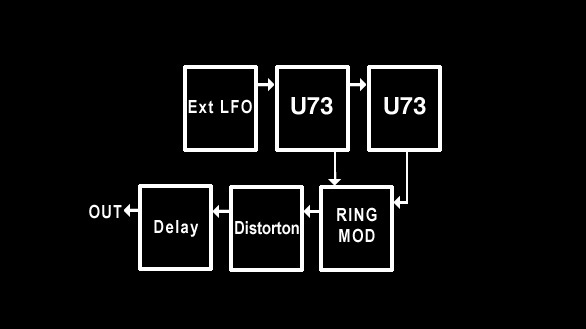 The master oscillator can also be modulated by an 8 step sequencer. The step sequencer cannot be programmed but has various preset patterns - forward, reverse, follow, random etc. The sequencer has a speed control; from zero (no steps) to audio range (in effect it becomes as a sixth oscillator). The fifth VCO is connected to the joystick controller, with the X and Y axis varying the frequency and volume. The joystick oscillator can also modulated by a small touch sensitive steel coil next to the joystick. The oscillator bank feeds into two circuit-bent effects units. The first is a multi effect with switchable and variable delay, chorus, phaser, flanger and pitch. This feeds into a digital reverb which has various modes: halls, rooms, springs. 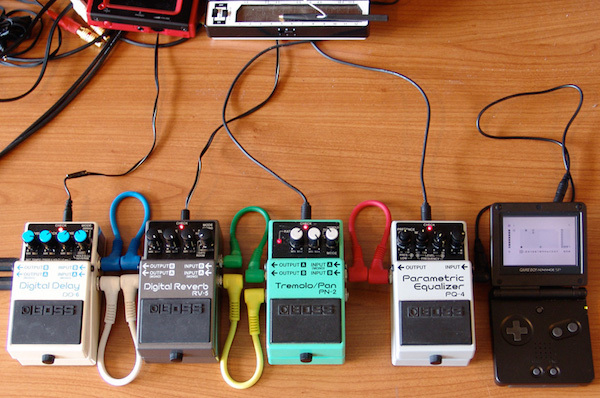 The effects chain has a separate feedback loop for introducing distortion and extreme feedback. The lid of the Tutti Box includes a small but powerful 'performer facing' amp & speaker and an 'audience facing' 6" plasma display. The display uses a mixture of Neon, Argon, Krypton, Xenon and Nitrogen to produce blue lightning strands triggered by the sounds generated. Tutti Box is powered by standard 9v power supply and includes a ¼” jack socket for connecting to a PA system. Recently while reorganising a studio cupboard I came across an old Korg MS20 USB controller. 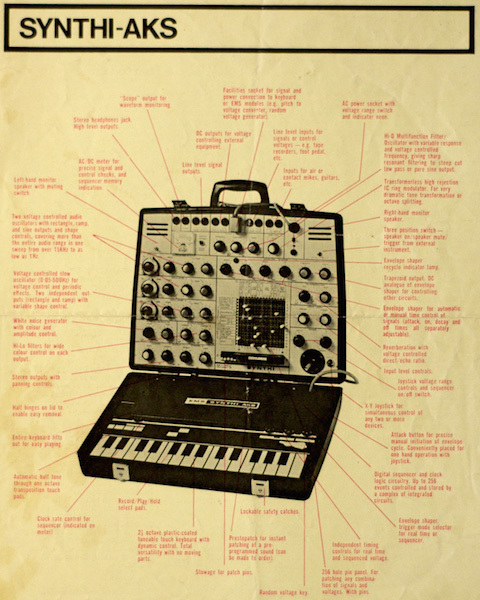 This reduced sized facsimile of the original MS20 synth was intended as a hardware controller for the MS20 soft synth plug-in that was part of the Korg Legacy Collection, back in 2004. But in one of those classic Eureka moments I wondered if there was a chance it would work with the new Korg iMS20 iPad app. And it does, perfectly. While this may not be news to some it was a revelation to me. Actually the reason this remote possibility (ha!) even popped into my head was by way of a similar occurrence a few weeks earlier, when I found out my new Roland V-Synth XT (while in retro D-50 mode) could be controlled by the original 25 year old Roland PG-1000 controller - but I digress. Of course you'll need the Korg iMS20 app (v1.1 or higher) running on an iPad with the Camera Connection Kit - which includes the requisite USB adaptor. To be honest initially it wasn't exactly plug n' play and it took me a few attempts to to get the iPad to recognise the MS20. The reason for this is that iPad wont let you use any external MIDI hardware that draws more than a minuscule amount of power but the MS20 controller needs quite a bit of USB juice. Unfortunately the MS20 doesn't include an external PSU socket so you'll need to use a powered USB hub as a bridge between the two. I'm not entirely sure why but it seems not all powered hubs are equal to the iPad (or the MS20) and it wasn't until I tried my third hub (a small Belkin unit) that the iPad recognised the controller. Actually there's a free App called MIDI Monitor that can be useful in these situations. Once you have it connected and communicating there are a few things to note: Using physical patch cables on the MS20 hardware is mirrored on the iMS20 App, which very cool. Another major benefit of using the MS20 controller is that it functions regardless of which mode the iMS20 App is in - Synth, Drums, Song or Mixer. This means you can tweak synth sounds while editing drums, patterns or changing mixer levels and without having to continually return to the Synth page, as you have to without the controller. Also you can use other MIDI controllers while the MS20 is attached to the iPad. Which means, I would imagine, that you could map other MIDI controller functions to any iMS20 parameters not controlled by the MS20… such as mixer levels, mutes, sequencer controls etc. I don't know what the iMS20 MIDI CC numbers are (I did a Google search but found nothing) but some trial and error should result in figuring them out. Finally make sure the MS20 controller is switched on (the large Volume control on the right is also an on/off switch) before you launch iMS20. If you accidentally turn off the MS20 while it's connected to the iPad it can confuse the App and make it unresponsive. Please don't ask me where to get an MS20 controller from, they went out of production years ago. As you may have read in the Mute press announcement elsewhere on this site I have a new solo album coming out in the Autumn. It’s an LP of totally new material and my first in 18 years. I began recording this new album (working title: Chemistry Lessons ’Volume One’) in 2010 thinking it would take about a year… then Sleazy passed away and I shelved it. A year later I picked up from where I’d abandoned it and began recording when I could. Which turned out to be in the spaces between dozens of live shows, countless remixes, recording as Carter Tutti and Carter Tutti Void and remastering and re-presenting our first five classic TG albums for vinyl. By late 2016 I had a complete and finished album which, at that point, no one other than Cosey had heard (endlessly as it happened (sorry Cosey)) and in a form I was finally willing to share… in this case with Mute. My previous solo album for Mute was The Space Between in 1991, which itself was a re-release from 1980… some 37 years ago! To date, and not including the odd solo tracks, collaboration album, reissued or remixed LP I have only released four solo albums: Small Moon (1999) Disobedient (1998), Mondo Beat (1985) and The Space Between (1980). So considering how much recording I do - which is a lot, it might seem odd that I haven’t released more solo albums - a question I’m frequently asked. Naturally (obviously) I have accumulated dozens of hours of unreleased solo studio material over the years but due to the ever present and often concurrent and overlapping projects of TG, C&C, Carter Tutti and Carter Tutti Void (somewhere in the region of 100 albums!) I’ve never found the time to go through all those audio files and compile an album from them - even when I was recording for my new album - which I wanted to be a completely new project in its own right. In the past I have put a few experimental solo tracks up on Soundcloud but I’m pretty sure there may enough unreleased material for at least one other album in my archive - if only I had the time to compile it all. Now maybe that should be my next project?